The FT has published a letter from me responding to Martin Wolf's column earlier this week on economist Robert's Gordon's claims of a stair step decline in per capita US GDP growth rates since 1950 as evidence supporting a thesis of an looming collapse in growth. 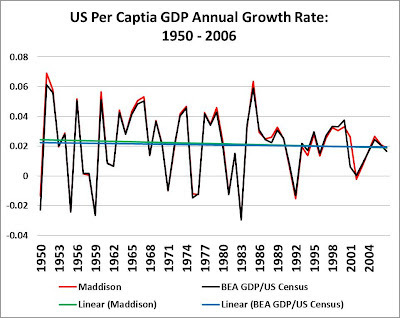 From 1950 to 2006, the period covered by Prof Gordon’s analysis, the rate of growth in US per capita GDP changed very little if at all, according to the Bureau of Economic Analysis. Debating the prospects for future economic growth in the context of innovation and productivity is important; however, such arguments should be grounded in accurate data. Prof Gordon describes his thesis as a “provocative fantasy” – a characterisation that I find to be completely accurate. The full letter is here. Background on this issue can be found here and here and here.